I develop technical training course content for IBM Lab Services and Training cloud computing curriculum. In the beginning level courses, I assume attendees have no previous background in cloud computing. It helps to talk about simple things that students can memorize and use as the base to learn more complex concepts of cloud computing. 1. Web based: A key selling point of cloud computing is its ability to provide services in the form of user interfaces for broader user bases. The Internet provides so many tools to present what the cloud has to offer. These offerings are mostly services for the use of the resources in the virtualization environment. Depending on the demands of the users, the web-based interface may be a graphical user interface that can be accessed from a web browser. 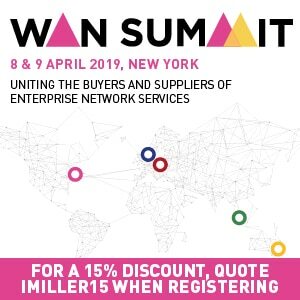 Other users may prefer to use different application programming interfaces (APIs) to communicate directly with resource components or a resource manager. You need to be sure that the user interface or API is available from the cloud service offerings. 2. On demand: Self-services for using the cloud cover many different types of users who have very different demands. For example, not all users expect high availability and high capacity 100 percent of the time. You should be able to request just the services you need for your work. With a variety of demands, the pricing models for using resources from a cloud are also different. You can pay the minimal rate per hour of use and then change that when your work requires more time or resources. 3. Resources: Your cloud environment needs to get its resources, such as servers, networks and storage, from somewhere. Depending on the type of work, your cloud resource requirements are different. In general, you may see recommendations for a virtualization environment. In this case, you or your system administrator should already be familiar with some of the popular virtualization management tools like VMware or PowerVC. These tools help manage your resources and provide the connections with the cloud environment. 4. Middleware: Much work has gone into the software that integrates all the software and hardware components into a cloud environment. All requests from users go through many activities and components before completion. Think of this middleware as the software infrastructure. OpenStack is an example of this type of software infrastructure. Other software products used by OpenStack are also in this category: databases, web servers or network managing tools. This simple WORM diagram helps summarize these cloud concepts and put the location of components in a cloud into perspective. 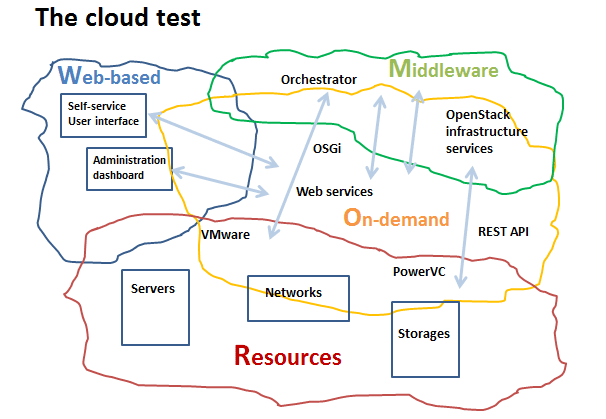 Try drawing your own diagram to test your understanding of cloud computing. Would you be able to identify the components that are most relevant to your job in the cloud environment?